In my newspaper column, 'Ask Deb Nelson', I had a question about how to add more colour to a dining room. The homeowner had an oak pedestal table they were planning on painting white. I found the image above as 'inspiration' for the room. I thought the addition of a modern, graphic wallpaper would look be a great backdrop to the room. 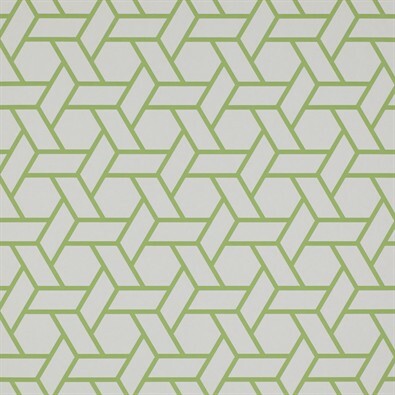 I suggested this paper in green, because I thought it looked so fresh with the white, but any colour paper would work to add a burst of pattern. I also suggested these chairs in white, they are affordable and can be easily wiped clean in case of spills. I also like these chairs because they can be stacked, so it's easy to store a couple of extras elsewhere and bring them out for additional seating as needed. A large piece of artwork or a mirror can be a great way to add a focal point on one wall. And last but not least, the addition of a drum shade chandelier really works well above the round table.